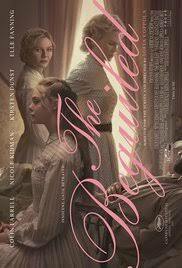 Review: The story unfolds during the Civil War, at a Southern girls boarding school in Virginia. They take in and care for an unexpected wounded union soldier. The house is soon taken over with sexual tension and dangerous rivalries this leading to jealousy and betrayal. This was first brought onto our screens in 1971 film by director by Don Siegel. I have not actually seen the 1971 version so therefore cannot compare them. Based on a novel which was written in 1966 by Thomas Cullinan. In Sofia Coppola version she is trying to see things and tell the story from the women’s point of view. It has been adapted by different perspectives and angles in the past. This version is about how the girls react when a man intrudes on them and how it affects the house. This is one of Colin Farrell’s best performances; in this he has a slight twinkle in his eye, has that certain charm. I can’t see any other actor playing this role. Apparently this is his favourite shoot in his career and has praised Sofia Coppola and also his co-stars. Because he enjoyed playing the role his charm came across and therefore was a delight to watch. During filming, he was forbidden from washing his hair with shampoo. Nicole Kidman gives a very strong performance. Although I actually thought that the strongest performance was by Kirsten Dunst. When her character came onto the screen, I felt that she was the one who had suffered the most and actually needed somebody in her life. It is like she has lost so many people in her life. You could say that this has some aspects in of The Falling, 2014 and did remind me of that particular film. This is a very dark and grim film and even the trailers didn’t prepare me of what to expect. I honestly did not know what was going to be the outcome in the end. The main question in this is who is beguiling whom? At the Cannes Film Festival in 2017 Sofia Coppola got an award for Best Director.